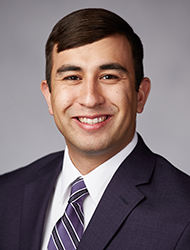 Michael Flores joined NSHE in November 2017 as the chief of staff. In this position, he works closely with the chancellor to ensure outcomes for the planning and implementation of programs, events, and initiatives. He also assists with NSHE government affairs efforts and day-to-day operations of the System offices. Prior his employment with NSHE, Flores served as the director of government affairs and communications at the College of Southern Nevada. He previously held positions as press secretary and political consultant to former Congressman Steve Horsford and as state director for Reform Immigration for America, as well as a graduate advocate coordinator for Workforce Connections. In 2010, Flores founded the non-profit organization, Nevada Youth Network, to provide homework help and recreational programming to children living in the Sherman Gardens Public Housing Development in Las Vegas. Flores attended the College of Southern Nevada before earning his bachelor’s in Public Administration from the University of Nevada, Las Vegas.